"The love of our town leads us"
Margate's history goes right back to prehistoric times; one of the exhibits in Margate Museum is the skeleton of a man, believed to be Iron Age, which was excavated during the building of the Police Station in Fort Hill. Many Roman remains have been discovered in the area, including a Roman villa in Tivoli Park Avenue, found by Dr Arthur Rowe in 1920. In the 7th century, the settlements on the Isle of Thanet were owned by Minster Abbey, but peaceful development was interrupted by attacks by the Danes, throughout the 8th, 9th and 10th centuries. The Confederation of the Cinque Ports was set up around the time of Edward the Confessor (1042-1066), although its precise beginnings are unknown and subject to debate. Without any written authority, the Ports brought smaller ports and villages under their jurisdiction, and thus St John's and Margate were brought under the control of Dover in 1229, a situation which lasted until the Margate was granted Charter of Incorporation, so becoming a Borough, in 1857. Margate continued as a small fishing port, with some cargo traffic, mainly corn exports, and much smuggling. The rise in popularity of sea-bathing for medicinal purposes started in the 1730s and became fully established in 1752, when Dr. Richard Russell published his book Dissertation on the use of Seawater in the Diseases of the Glands, which advocated both the benefits of sea-bathing and the drinking of seawater. Visitors, mainly from London, came flocking to the town and its development as a seaside resort followed, with Cecil Square being built in 1767 followed by the Royal Hotel and Assembly Rooms and Hawley Square. By 1800, the town's population was 4,771. 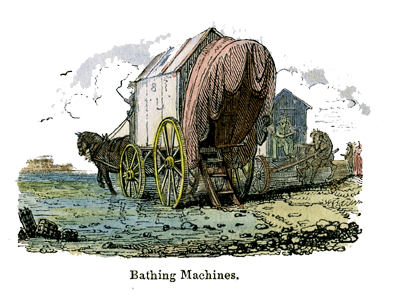 Contrary to popular belief, the bathing machine was not invented in Margate. Its first use was in Scarborough, in North Yorkshire, around 1730. In its early days, sea-bathing was a quick total submersion in the water and was intended as a medical treatment rather than a pleasant experience. The bather took off all his or her clothes in the bathing machine and was then plunged into the sea by attendants. Margate's enhancement to the bathing machine came in around 1750, when Benjamin Beale, a Margate glove and breeches maker, invented a canvas hood which could be pulled down to protect the naked sea-bather from prying eyes. The hiring charge for a bathing machine in around 1770 varied from 9d for two or more gentlemen bathing themselves to 1/6d for a gentleman taking a machine with a guide. It is believed that naked bathing continued until 1862, when a Byelaw was passed stating that male and female bathers were to be segregated by not less than 60 feet, and that all owners of bathing machines would provide gowns or dresses to female bathers and drawers or similar to male bathers. The Royal Sea Bathing Hospital was opened in 1791, when it was believed that sea bathing and sea air were the best cures for tuberculosis. Patients in their beds would be pushed from their wards into the fresh air, and the hospital had a sea-water reservoir so that patients could be bathed in sea water. As the years went by, sea bathing became more of a pleasurable thing to do and the town was developed rapidly as more and more visitors came to the seaside. The road between Westbrook and Margate (now Marine Terrace) was built in 1806 and a few years later the number of people coming to the town on sailing hoys from London reached its peak. The first steamboat arrived in 1815 and this was the first of a long line of steamboats and paddle steamers which served the town, right up until the 1950s. The biggest change, though, came in 1863 when the London, Chatham and Dover Railway opened its station in Margate, providing a relatively inexpensive service which took less than three hours from London and was not weather-dependent like the steamboats. Margate continued to develop as a seaside resort until the 1970s when, in common with many other British seaside towns, it lost out to the attraction of cheap package holidays abroad. The town has much to offer the holiday-maker, with its Blue Flag beaches and lovely coastal scenery, art galleries and cafes, and after some years in the doldrums this historical town has got a new lease of life and is very well worth a visit.